Homes and villas in Los Cabos offer attractive locations at prices that are far below similar properties in the United States. Beachfront homes and villas can be found for half the price that one would expect to pay for coastal residential property anywhere else in North America. When you add the fact that real estate appreciates at a faster rate here in Cabo than the U.S., buying a home or villa as a vacation property or principal residence makes good financial sense. Of all the areas in Baja, Mexico, Cabo San Lucas and the Los Cabos region is the most popular destination for foreign real estate investment in vacation, retirement and primary residences. Each area offers its own distinct benefits. Finding the right area for your purchase involves making some lifestyle decisions. Do you prefer being walking distance to town or would you prefer to be outside of town in a more tranquil setting? If you prefer a more tranquil setting, are you willing to live "off the grid" relying on your own power, water and septic system? Is golf course or master planned community living more your style? All these questions and more will have a big impact on where your ideal property can be found. If you need help making that decision, we invite you to contact us about Los Cabos real estate. Turnkey Beautiful Family Home, perfect for entertaining. When you enter the front Gate you are surrounded by a beautiful garden, with a water fountain and lots of seating areas. Going in the main door, you are greated by a spacious open floor plan, with a very good sized living room and dining area. This home has an amazing Chefs Kitchen, with Granite Countertops and pristine cabinetry. It really shows the attention to detail that was put into its elaboration. Casa Canfield has three bedrooms and two full baths, plus two Bonus Rooms set up as extra Bedrooms. One large workshop and a huge Bodega. The terraces are gorgeous, and include an outside kitchen perfect for BBQ's and family gatherings. Conveniently located in the Center of Town. Feel what its really like to live in Mexico. Here's an amazing opportunity to own a high-end, luxury view villa with endless views to Land's End, Cabo San Lucas and the Sea of Cortez. El Cielito represents what we think is one of the best values in residential real estate in Cabo San Lucas in the $399,000 to $1.15 million price range. 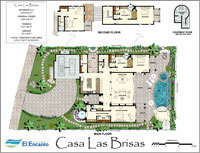 18 new, never lived in villas are offered for sale in this guard gated neighborhood within Rancho Paraiso. 2-4 bedroom villas feature loads of custom stonework, private 2 car+ garages, and exquisite architecture created by renowned Los Cabos architect, Prospero Tapia. Noting but high-end materials are found both inside and out. Common area amenities include a free-form infinity pool and spa, fire pit seating area and unobstructed views. Original sales prices ranged from $530,000 to $1.5 million. However, new ownership has dramatically reduced prices as of May, 2014. The remaining 18 villas now start at $399,000! You won't find a better deal without the views... this truly is an exceptional deal. 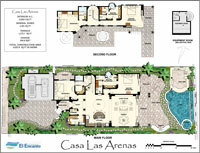 Querencia in Los Cabos is a premier country club estate development midway between the Los Cabos Intl Airport and Cabo San Lucas overlooking Palmilla Bay. The private residential development features a world-class Tom Fazio designed championship golf course and a 40,000 square foot Village Club – and membership to the social club comes with the estate! Owning here puts you amongst the elite property owners in Cabo, and with that exclusivity comes excellent appreciation in value as demand for high-end properties increases. Villa Vista del Mar... a 5,185 square foot villa that boasts over 21,500 sf of outdoor living space on 1.28 acres of prime ocean view land. In fact, Villa Vista del Mar has without a doubt, the biggest blue water views of any estate in Querencia. Add the fact that this home comes fully furnished, move-in ready and you have an outstanding investment opportunity here in Los Cabos. Priced at $2,699,000, Villa Vista del Mar is priced at the low end of the market for homes within Querencia. Come live the good life at Querencia, Los Cabos. 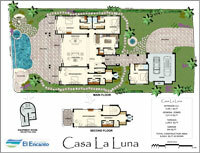 LUXURY HOMES IN A PRIVATE GATED COMMUNITY ON A PRISTINE BEACH ON THE SEA OF CORTEZ! If living on what just may be the most beautiful stretch of white sand beach in Los Cabos is what you've been dreaming of, it's time to wake up and smell the sea air! The slideshow and virtual tour above gives you an idea of the natural beauty that's found at El Encanto de la Laguna, but it doesn't even come close to seeing it in person. 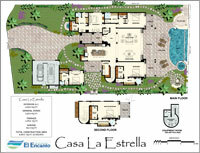 Baja International Realty has entered into a marketing agreement with the developers at El Encanto that gives us the ability to negotiate outstanding sales prices and terms for buyers looking to own prime coastal Baja property at a price that's less than half of what you'd pay for similar properties in Cabo or the tourist corridor. 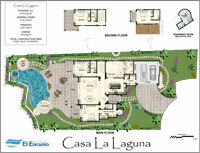 El Encanto de La Laguna is an exclusive beach front community consisting of 36 estate home sites and 59 luxury condominiums located only 3 miles from the new Puerto Los Cabos marina, 15 minutes away from the historic colonial town of San Jose del Cabo, and a short 25 minute drive from the international airport. Designed in “Hacienda” style, the estate homes are constructed by the developer’s in-house construction team thereby maintaining the highest level of quality throughout each residence. 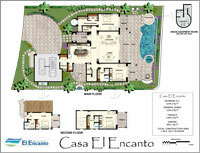 Private yards with pools, stone driveways, enclosed garages, flagstone entries, clay tile roofs, infinity pools with spa and swim up bars, Palapa bar with refrigerator, sink and flagstone flooring... these are just a few of the custom touches that come with each and every estate at El Encanto. To get an idea of the layouts available in the six estate designs, click on any of the floor plans to the right to download a PDF file. To arrange a private showing, or to get more information about El Encanto, contact us via email or call: 1 925 465-5373 from the U.S. or Canada or 624 143-5555 from within Los Cabos, 011 52 1 624 129-6245 if calling internationally from outside the U.S. or Canada.